We flew from London to Istanbul, the only city in the world that exists on two continents, Europe and Asia. We didn’t get out to site see, just stayed a night in the hotel and flew out to Hatay the next day. The Hatay airport was really our first “we’re not in Kansas anymore experience.” I got to see my first Turkish toilet! Thankfully I didn’t have to use it! We were met at the airport by a doctor from the charity. She still has family in Syria and we’d like to keep her identity private for safety reasons but I will say she is amazing! She’s worked and travelled all over the world, using her medical skills wherever she can to help others. 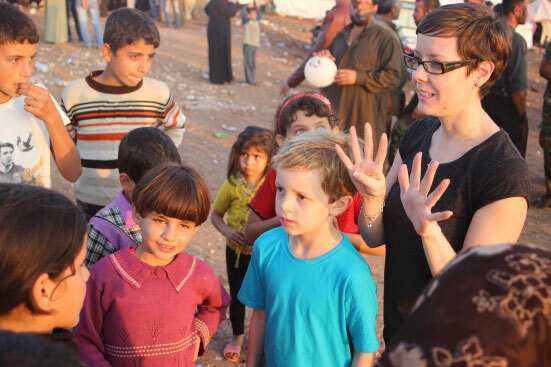 Of Syrian descent, she has poured her heart and her time into helping Hand in Hand. She preferred to rough it in a no frills hotel at the border but thought we might be too used to creature comforts and so found us a room in the nicest hotel in Antakya. It still wasn’t 4 stars but we couldn’t complain. The next morning we were met by the Dr and a Syrian activist. Again to keep her identity private (and because I can’t spell it) I’ll call her R. Having been working in Antakya for a while R had made many connections — something that is imperative for this kind of work. All of our interactions were because someone knew someone, who was family of someone else, who worked down the street from someone who struck up a conversation with someone else etc. Anyway, R was able to take the money Joseph raised, plus some Hand in Hand matched funds, and purchase a truckload of winter clothes. Literally. A truck load. We stocked up (again, with someone R knew who would give us a deal) on sweets for Eid and made our way to a refugee camp to deliver it all. The first camp was on the Turkish side of the border, run the by the Turkish military. We arrived at the camp not knowing at all what to expect. It was surrounded by a cement wall, about three feet high. On top of this was chain linked fence covered in canvas. On top of this was barbed wire. There was a door through the fence, blocked by a heavily armed Turkish man. The Dr spoke English and Arabic. R spoke English, Arabic, and some Turkish. Our driver spoke Turkish and Arabic. The clothes truck driver (who also sold us the clothes and brought his family along) spoke Turkish. The Turkish military men spoke Turkish and some Arabic. We only spoke English! R assured us that this was all previously arranged and they were expecting us. People from the camp came out to speak to us. More people arrived. Our passports were passed around. Half of the men were armed. It seemed like all of them were yelling. It was incredibly confusing and stressful. We pulled out one of the footballs Joseph brought, in the hopes that it would show how peaceful and well meaning we were. It worked, sort of. They let Joseph in. I thought “Great, this is it. We’re in.” I followed right behind him and was subsequently blocked and pushed back out by a very large Turkish man with a very large gun! So now, Joseph is in a refugee camp, Joseph’s Dad and I are outside, someone else is holding our passports and we can’t understand a word anyone was saying! Little stressful. Apparently, R had arranged our visit, but not with the people who were currently there. Several phone calls were made, trying to persuade them to let us in. They were concerned that we were either journalists or spies. I think I’ll mention to the CIA and MI-6 that dragging along a 7 year old isn’t a very good cover for a spy. What a James Bond movie that would make?!? The camp men finally agreed to bring a few children out for us to give a few gifts to and then we could leave the rest with them to distribute. This wasn’t acceptable to the Dr. Bless her heart. She stood her ground that Joseph had worked hard to raise that money and that she intended for him to see the results of his hard work. We were able to pass a few things out to a few children, but as we weren’t prepared to hand over the truckload of clothes the atmosphere got a bit more intense. The Dr quickly shuffled us into the cars and we drove away. While it may seem unreasonable to not allow us into the camps when all we wanted to do was help, it is understandable. The Turkish government was in a difficult position. As a bordering neighbour they received over 100,000 Syrian refugees. This is a huge influx of helpless people that any country would struggle to cope with. Combine that with an already complex political history in this area and Turkey’s decisions could never be easy. Our first venture into aid work hadn’t gone too well. We were tired and frustrated. It was at that moment that the Dr suggested we try a different tactic. If we couldn’t help in Turkey by following the proper channels, maybe we could help in Syria, if were willing to try other means. She assured us that it was completely safe. But hadn’t R assured us that the Turkish camp was expecting us? She assured us that she knew the right people to make it work. But hadn’t R assured us the same thing? While I know R never mislead us, everything she promised hadn’t exactly worked out. Why should we, or even could we put our faith and trust in the Dr? Joseph’s Dad didn’t skip a beat. He agreed instantly. If that is what needed to be done, that is what we would do. I love that man. I thought he would want to think it over, work through every plausible outcome, some sort of cost/benefit analysis, maybe even a chart or a graph. Heck, maybe even a prayer or two! But no, he agreed instantly. Let’s thoroughly plan and research any purchase over £50 – but take our 7 year old into Syria to visit a refugee camp? Sure! The following morning we woke up early to being our journey to Syria and the camp. Antakya is about 20 minutes from Reyhanli and Reyhanli is five minutes from the border. We should be there before lunch! We forgot to take two things into consideration, first Arabic Time and second Aide Time. Both add about an hour to any 5 minute task! Joseph and I accompanied the Dr to her hotel to organize our trip. Joseph’s Dad accompanied the driver to a baklava shop to get treats for the some of the other aide workers and leaders in the camp. Thirty minutes, right? Ninety minutes later, he comes back, almost green and with baklava practically coming out of his ears. The driver left him, the shopkeeper took him to the back and plied him with every different kind of baklava available. While this might be my idea of heaven, Joseph’s Dad hates nuts! Poor guy, but I have no sympathy, only pure jealousy! We were off, but had to make a quick stop by a school first. This school was only recently established to educate the Syrian children that were able to make it across the border and were living in Reyhanli. I’m sorry, did I say quick? Ninety minutes, rounds of tea and baklava, and a game of football later, we were finally off. But first we had to quickly go back to the dr.’s hotel to meet up with someone that could help us. There’s that word again: quickly! Eventually, a young good looking kid jumps into our car. He looked barely older than 20 and a bit too good looking to really be helpful, if you know what I mean! But, he seemed enthusiastic and spoke Arabic, Turkish and English, which is more than I could say for us! He was also glued to his mobile. Again, to protect his identity, I’ll call him K. He made phone calls the entire ride to the border, slipping seamlessly between multiple languages and multiple conversations. My opinion changed, I thought he might be able to come in handy! We arrived at the Turkish border, just a “quick” stop before we get through to the camp. Now, for those that don’t know, border crossings make me nervous. Any border crossing. Going into Canada from the US? I’m nervous. Coming back home to England from anywhere else? I’m pretty sure I’ll be denied entry. I never do anything illegal, but for some reason border crossings make me anxious. Throw in the Turkish military, giant guns, being unable to understand the language . . . I was a wreck. We spoke with the guard, brought him some food and waited. And waited. And waited. Joseph and I popped out of the car to stretch our legs, just as a large military vehicle full of men pulled up. We quickly hopped back in — and this time we really were quick! More phone calls, more passing around of our passports, more Arabic/Turkish discussions with the occasional “American!” dropped in. More attempts to convince them we weren’t spies or journalists, just well intentioned (and a bit naïve) Americans. I’m not sure if we ever really convinced them. Eventually they agreed that we could cross the border IF we got out of the car and walked around to the camp and promised to leave in an hour. Finally, we were in Syria at the camp. If you thought trudging through this blog post just to get to this point has been excruciating, imagine how we felt! We could see the camp; white tents on a hill, as we drove up to the border crossing. As we walked through the rocky meadow to skirt the crossing and reach the camp, the magnitude of the camp came into full view. It was huge, bigger than I expected. Rows and rows of white canvas tents, in and amongst an orchard of olive trees. There was no bard wire, the only fence being the one separating Syria from Turkey. Only a couple toilets, already overflowing. There were two shower blocks, but these were only for the women. A tiny store. A field hospital. As we could see them, they could see us. Apparently two Syrians accompanied by two American adults and one American child, walking and carrying footballs and sweets isn’t an every day sight. We were met by several children, and then more children and more children. 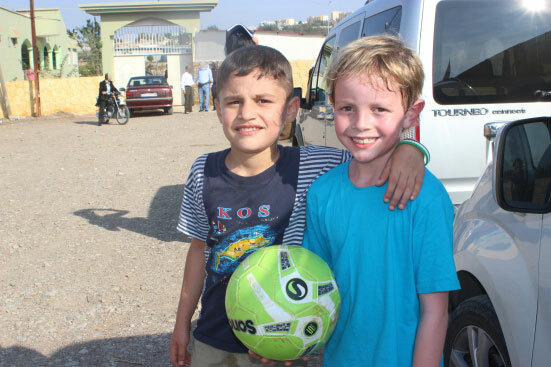 The footballs were shared and mini matches started. We passed out the Eid sweets. With so many children and so many sweets it became a bit chaotic. Joseph’s Dad was surrounded (engulfed?) with children and panicked a bit as Joseph was pulled away from him. K caught his eyes, saw the panic and just lifted Joseph up and out of the way. The night before, after our first failed attempt, the truck of clothes was smuggled into the camp and stored in a “warehouse.” Once we arrived, the camp managers began sorting out the problem of distribution. The camp was run by the Free Syrian Army and it was extremely well organized. The man in charge carried a notebook with the names, ages and needs of everyone in the camp. It was decided that we would load the clothes onto a truck and distribute them tent by tent. This would prevent any panic or chaos and everyone would get what they needed. While this was happening, Joseph and I were left to our own devices. Having already passed out the footballs and sweets I felt a bit awkward. Empty hands and no way to communicate I wasn’t sure what to do. The Dr taught us how to say “What is your name?” We tried that. I’m sure my pronunciation was completely wrong but the children understood. We went around the circle of children surrounding us (we were always surround by a circle of children) and one by one asked them their names. A few of the older children spoke a few words of English. It’s amazing what a few words and lots of hand gestures can convey! They all tried to teach me to count in Arabic but I could never get it. My inability to count to ten or even correctly pronounce their names made them all laugh. As Joseph and I walked back to the warehouse to see how it was going a boy came up to share his pomegranate with us. It touched me, that a child that obviously had so very little in this world was still willing to share what he had with us. Joseph did not share my sentiment. A picky eater in a normal situation, he saw that pomegranate and wanted nothing to do with it! I explained that you eat the seeds. He still didn’t want it. I explained that this boy had nothing and was trying to share with him. He still didn’t want it. I whispered in his ear that if he knew what was good for him, he would try the pomegranate seed, smile and say thank and if he did all that I would pay him £10. Not my finest parenting moment, but he ate the seeds and smiled at the boy so it was worth it. Eventually we started to distribute the clothing. It was the definition of organized chaos! A truck loaded with the clothing pulled along side us. Several FSA soldiers held stacks and stacks of mittens, scarves, hats and jumpers. One by one we went to each tent, handing out clothing for the children in preparation for the cold months ahead. It was difficult and confusing. Everyone was happy and excited, but also talking and shouting. There seemed to be a lot of shouting, almost too much and I worried that we were doing something wrong, that maybe we were actually causing problems instead of helping. I asked Joseph’s Dad what was happening, what was wrong. He explained that the giant man shouting the loudest (and was the most intimidating) was actually telling Joseph’s story. Every tent we went to he repeated the story of a 7 year old American boy that swam the English channel to raise money to buy clothes for the Syrian children. They were amazing. They all wanted to shake Joseph’s hand or kiss his cheeks. He was quite overwhelmed by the attention. As the children took the clothes I watched the faces of the mothers. To be honest, the children were probably more excited about the footballs and sweets, but the mothers knew. They knew they fled their homes in the warmth of the dying autumn sun and that winter was quickly coming and the canvas tents wouldn’t provide enough protection from the harsh and bitter cold. They knew that Joseph wasn’t giving them a few hours of fun kicking a football or a few minutes of enjoying a sweet, he was giving them warmth. It still won’t be enough. The children will still be cold, but it was the best he could do. However inadequate, he was doing what he could do to help them. The people in these camps literally have nothing. They fled with the clothes on their backs, sleeping on the dirt, covered only by canvas tents only recently donated. My heart was broken and put back together again several times over during our visit. As a mother, to see other mothers struggling to take care of their children, was too much to handle. A few times I had to stop to hide my tears — who was I, to be overcome with emotion when they were the ones living this, every day, every hour? The sun set and it was time for us to go. As we began out descent to the border a woman quickly caught up to us. Through out interpreter she asked if Joseph was my son. I nodded my head and she said something in Arabic, which meant God bless your son. My heart skipped a beat. My voice caught in my throat. At that moment, in the time of her greatest need she still called upon God to bless MY son. My heart broke then and it breaks again as I write this. Having overstayed our time limit getting back into Turkey would prove a bit tricky. Fortunately, we had the ever resourceful K. A few quick phone calls and a car was waiting for us at the border. We hustled into the car, the driver gave a little nod to the tower and we sped away. I’m not quite sure what K said or did, or what the driver said or did, but I’m pretty sure we’re not getting our passports stamped for that visit to Syria! We owe the Dr and K so much for making our trip possible, for changing our lives with this experience. The Dr, working and living in England, but her thoughts and heart back in Syria with loved ones and with those that have been killed in this war. K, our handsome smuggler, forced to put his education on hold and flee the country, still fighting in anyway he can. What more can we do to help them? To help the children and the families stuck in the camps, waiting to go home or waiting to move on but not able to do either? We asked K, and he asked that we tell what we saw. So, here is what we saw. We saw displaced men, women and children. We saw tents under the olive trees. We saw children without warm clothing or shoes on their feet. We saw FSA soldiers provide aid and organization. We saw volunteer doctors and makeshift field hospitals. We saw men being taken into the hospital on stretchers. We saw children with bandages. We saw sadness and confusion and anger. We did see some things to give us hope. We saw children sharing the sweets and toys we brought. We saw people laughing and playing. We saw smiles. But as much as I’d like to tie this up in neat little bow, my heart breaks again as I write this. Since we left Syria, more than 10000 refugees fled their homes and crossed into Turkey. It’s getting colder. There isn’t enough aide. There are threats of chemical weapons. There are clusters bombs. Dozens were killed today alone as they queued for flour at a bakery. I believe it will get worse before it gets better. But I believe it will get better, I have to.